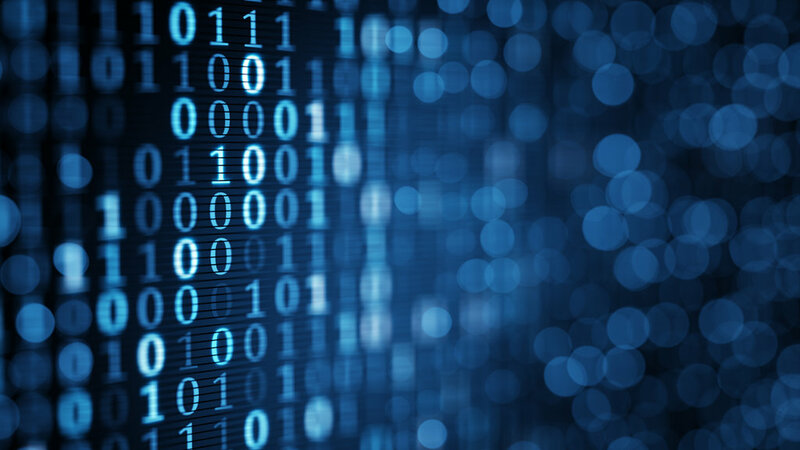 For the purposes of this article we are going to focus on creating a multi-node development environment for a Splunk architecture. This is useful for DevOps/Splunk engineers developing on their local workstation or laptop. 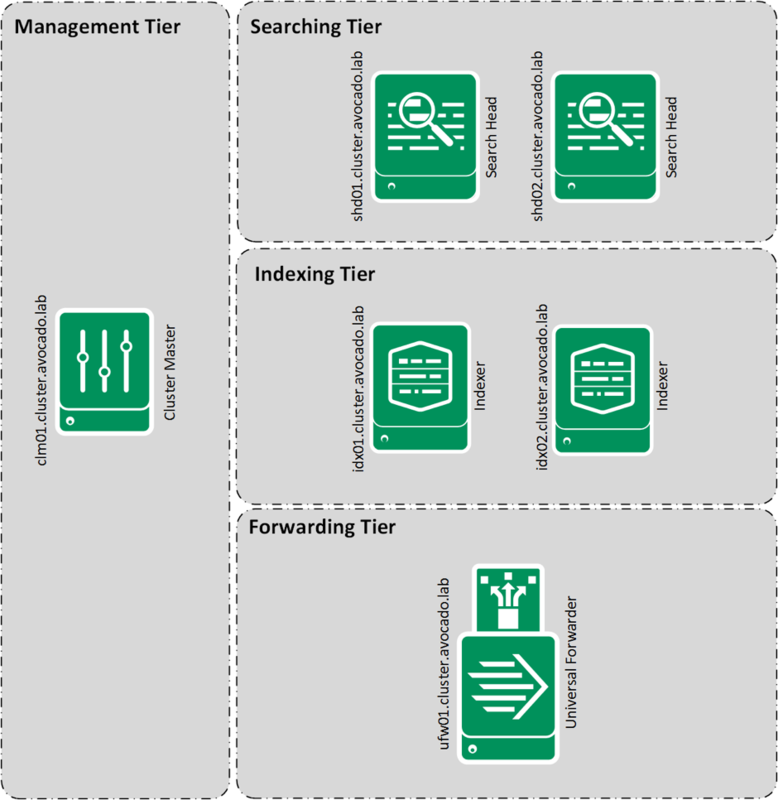 For this we are going to create a standard Splunk infrastructure (Cluster Master, two Search Head and two Indexers). In addition, we are going to use an automation technology to provision the servers and ensure the infrastructure is immutable. For this reason I have also created a management server called “mgmt”, this will allow Ansible playbooks to be run within the environment for users on Windows operating systems. Note: Feel free to follow along step by step (however I haven’t documented everything here) but all this code will be released publicly on GitHub. The architecture (which will be a plain vanilla install of the Splunk with some clustering configured) will look like below. This meets the minimum requirements of a Splunk Cluster with data replication. 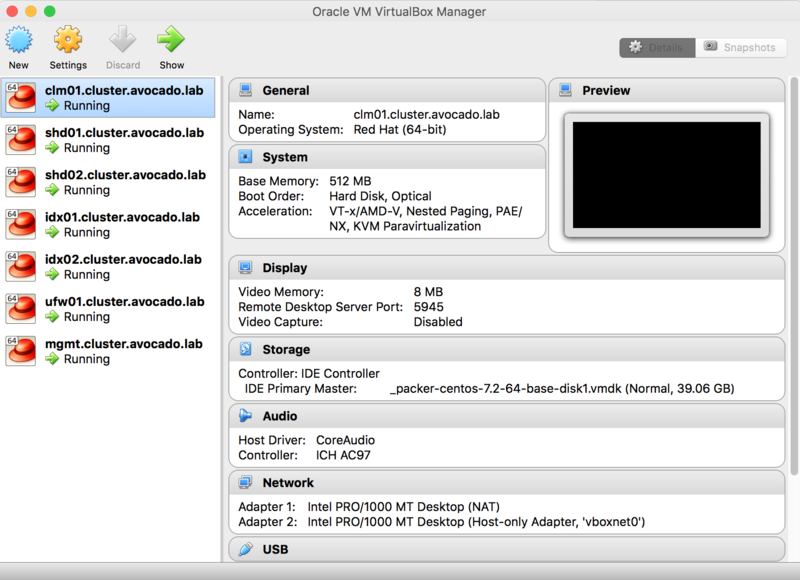 Virtualbox – An open source virtualisation software for creating virtual machines. Vagrant – A wrap tool for orchestrating the creation and configuration machine of virtual machines. Ansible – A powerful, self-documenting automation tool. Note: While I’m using the above tools, I don’t cover the installation of these tools. The installation of these tools is sufficiently covered in the documentation for the relevant toolset. See the links above to find the documentation. Let’s start by creating a blank project directory and a Vagrantfile to house the configuration for our vagrant lab environment. If those commands worked correctly for you, you should now see the Vagrant file if you do a directory listing. Doing a cat of the file should reveal all the default configuration and comments that come along with a default generation of the Vagrant file. That looks a little bit busy so let’s tide it up by removing all the comments we don’t need. Your Vagrant file should look something like this now. Instead of the base box, I’ve decided to use Centos 7 as the default box. To do this I’ve just replaced the value of the config.vm.box to be centos/7 instead of base. I’ve also set the config.ssh.insert_key value to false. The reason for this is marginally quick boot times and I don’t need to replace the default vagrant key as this is my local environment. Ensure your Vagrantfile looks like the code above. Now that I have my basic configuration lets test that we can load up our default box and ssh to it. Everything looks good from the above screenshot apart from the fact that we don’t have guest editions installed. That’s not a huge problem however it does limit us from mounting a shared volume between my host and guest machine. We can tackle that later as that is functionality I find useful. In the meantime lets destroy the vagrant machine we have created. Vagrant comes with a long list of plugins that extend it’s functionality. For this tutorial I need three plugins. One of these plugin is Landrush. Landrush provides local DNS resolution support within the vagrant environment. The others are the Ansible and the Shell provisioner, Ansible and Shell are the provisioners for our vagrant environment. Ansible can be used to directly provision the vagrant boxes if you are using a Unix or Linux operating system. If you are using a Windows operating systems then we can create an additional box to be used as a provisioner. Installed the plugin 'landrush (1.1.2)'! Installed the plugin 'ansible (0.2.2)'! For a list of vagrant plugin see the Github home page https://github.com/mitchellh/vagrant/wiki/Available-Vagrant-Plugins. Most architectures don’t consist of one box on a workstation. We are going to replicate the architecture mentioned above. 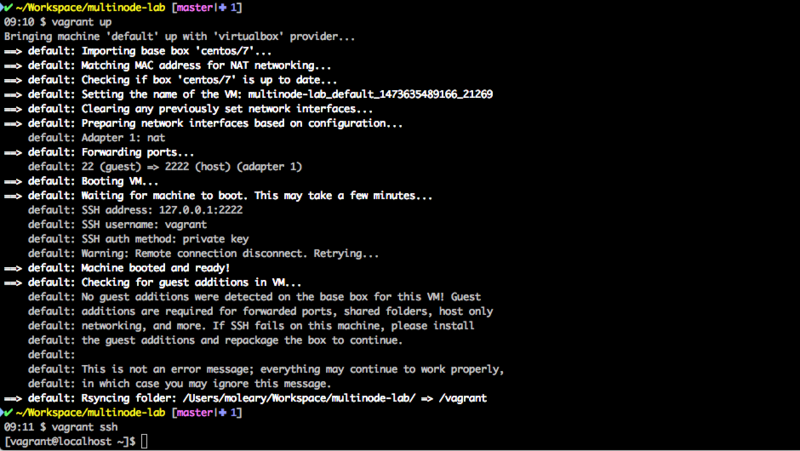 I’ve added a sub directory “ansible/vars/cluster/guests/guests.yml” under our lab directory. In this directory I have added guests.yml to define some nodes. I’ve also added some ram values, so I can override the default ram value of 256MB. In addition I’ve updated the Vagrant file to reflect the changes for the multi-node environment. Running vagrant status will show the hosts define in the guests yaml file. ==> clm01: Machine booted and ready! ==> clm01: Landrush IP not installed in guest yet (or it's an outdated version). Installing now. ==> shd01: Machine booted and ready! ==> shd01: Landrush IP not installed in guest yet (or it's an outdated version). Installing now. ==> shd02: Machine booted and ready! ==> shd02: Landrush IP not installed in guest yet (or it's an outdated version). Installing now. ==> idx01: Machine booted and ready! ==> idx01: Landrush IP not installed in guest yet (or it's an outdated version). Installing now. ==> idx02: Machine booted and ready! ==> idx02: Landrush IP not installed in guest yet (or it's an outdated version). Installing now. ==> ufw01: Machine booted and ready! ==> ufw01: Landrush IP not installed in guest yet (or it's an outdated version). Installing now. You should now have servers virtual machines that can be pinged using their corresponding DNS names. In Part 2 we will explore the integration of the Ansible playbooks to assist with on the fly provisioning of the virtual machine.